In this episode, I interview Dakota Shane, a social media columnist for Inc.com. He co-founded Arctiphi, a social media agency for breweries and restaurants. He’s also a top writer in the social media category on Medium. Dakota shares how to maximize your content’s reach using Medium. You’ll discover tools and tactics for building your email list with Medium articles. Medium: Why Bloggers Should Consider Publishing on Medium featuring insights from Dakota Shane on the Social Media Marketing Podcast. Right after Dakota graduated from college in 2015, he and his brother launched their agency. Dakota was learning all he could about marketing, social media marketing, and content marketing from podcasts, books, and client experience. Dakota comes from a family of creative people and grew up writing stories. In his career, this writing bug stayed with him and he wanted to write about what he was learning as a marketer. At the time, his two choices for housing content were the blogosphere and LinkedIn. Although the blogosphere was the gold standard, Dakota felt that the landscape was saturated and it would take too much time and effort to gain a following while also working a full-time job and running a business. The articles Dakota wrote on LinkedIn flopped, and the platform also seemed a little too formal for his voice. When Dakota found out about Medium, he was excited because it looked like a place where he could talk and write the way he wanted. Based on everything he’d learned since college, Dakota wrote an article titled 200+ Podcasts, 100+ Articles, and 20+ Books in 11 Bullet Points. Then he dug up the personal Twitter handle of the editor of his favorite Medium publication (The Mission) and sent him the link. The editor replied, saying the article looked great and would be published in the morning. Dakota Shane put all of the things he had learned into one Medium article. The next day, Dakota woke up to a slew of notifications: hundreds of people shared and thousands of people had already read the article. He saw the power of Medium as a platform and realized his life and business were about to change for the better. Dakota has been seriously writing on Medium for the last year and a half, and his consistency on the platform has led to opportunities with niche social media blogs. To get those opportunities, he gathered links to his highest-performing works on Medium, wrote a pitch on why he would be a good fit for their publication, saved it as a draft, and kept sending it out. After landing spots on bigger social media blogs, Dakota used those credits as leverage to get his first speaking gigs and podcast interviews. On his third try pitching to Inc.com, he landed a column and has been writing for them for the past few months. Listen to the show to discover who shared Dakota’s first Medium post. There are four reasons to write on Medium. First, Medium provides a ready-made audience that most writers, creators, or marketers don’t have and that would take years to build. Medium’s ready-made audience can help jumpstart your positioning. Second, and most importantly, Medium presents an opportunity right now because it’s at that sweet spot between an emerging platform (which could be a risk) and an established platform (which could be saturated). Since it’s in this position, Medium can open doors for a creator, writer, or marketer to brand themselves as an authority on a specific subject. Although Medium has kept recent metrics to themselves, as of late 2016 there were 60 million monthly users on Medium. From 2015 to 2016, the number of posts has increased by 295%. Third, Medium can help you build an email list. Simply include a call to action in your article that either links to your squeeze page or add an email capture tool such as Rabbut or Upscribe. These free tools allow you to gather emails on Medium itself. With Medium’s ability to embed files, you can simply embed your email capture tool at the bottom of your articles, making the email-capture process pretty seamless. 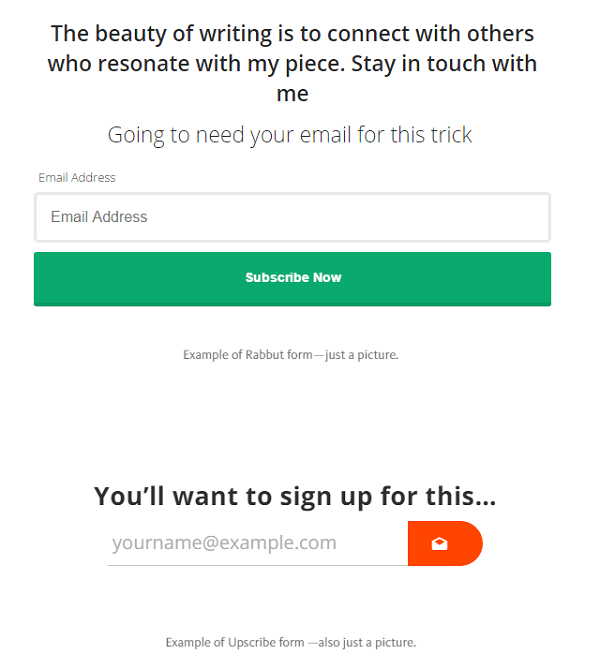 Gather email addresses on Medium using tools such as Rabbut or Upscribe. This last reason, which is close to Dakota’s heart, is Medium is a low touch point channel. It’s not like Twitter, the crying child of social media that needs your attention 24/7. Medium is the good kid who does their chores without being asked. If you’re creating content already, it doesn’t take that much more time to be active on Medium. Publish articles, respond to comments, and read cool stuff. 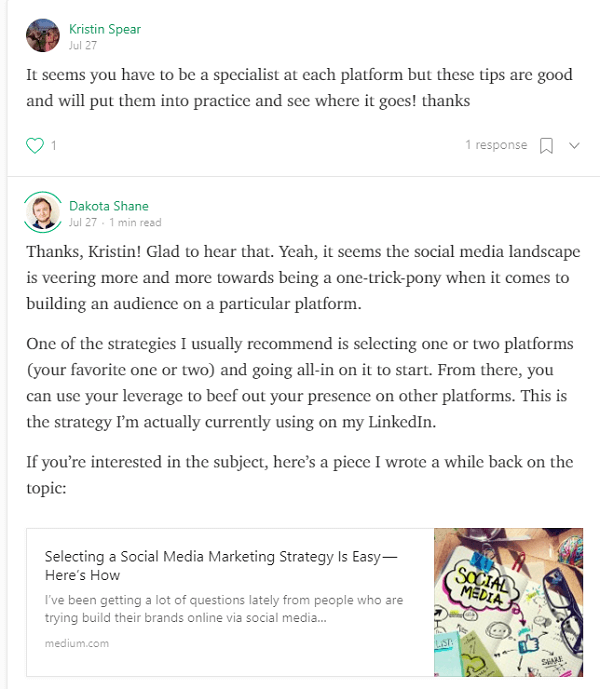 Engage with people who comment on your Medium posts. Medium co-founder Ev Williams also developed Twitter and Blogger, Dakota adds. If you have an existing following on Twitter, when you create a Medium account, you import your Twitter contacts who are on Medium. So if 10,000 of your 20,000 Twitter followers are on Medium, you’ll automatically get those 10,000 followers. Listen to the show to hear Dakota compare Medium to WordPress. If Medium were a newsstand, the publications would be the different magazines, newspapers, and pamphlets available. Publications cover a range of topics, can publish independently, and can monetize independently of Medium. After your writing appears via a Medium publication, you have an option to submit any of your stories directly to them. You can also publish your posts independently. When you go that route, editors may ask to add one of your posts to their publication. You can write for as many Medium publications as you’d like. However, a story can live on only one publication. So if you write a story for one publication and then want to publish it on another, you need to take down the first story before you can resubmit it elsewhere. You have a few options to discover publications. When you sign up for Medium, it gives you suggestions. A third-party tool called TopPub.xyz ranks publications based on the number of followers and gives you a link to each publication. Top Publications is an excellent discovery tool for Medium publications. Tags and search are also useful tools for finding publications. Dakota says writers add the tags when they publish a story. (Publishers can add tags too, but typically don’t do so.) Then, when people type a term in Medium’s search box, they see a section of tags that match the search term and can then see related tags. You can tailor your feed based on a tag you like. Similarly, you can search for and follow people and publications. Anyone can create their own publication, but Dakota recommends doing this only if you have someone who has the time to edit it. Editing a publication takes a ton of time, whereas writing articles as a contributor to a publication is less of a time commitment. I ask how readers are notified when a publication has new content. Dakota says it depends on how the editor of a publication handles outreach. For instance, someone who subscribes to The Mission will receive a mobile notification when new content is published. Many publications have a newsletter that helps followers stay up to date. Medium also has features that highlight content for potentially interested readers. Medium sends out email notifications on top stories each day. On your desktop feed, new content appears in a section for publications you follow. Listen to the show to learn how to determine the size of a Medium publication. After you find a publication, go to their home page on Medium and search the archives for “submission guidelines.” Most publications will have a post that tells you how to submit, whom to email, and what types of stories they accept. Search for a publication’s submission guidelines on their home page. Unable to find submission information? Find a relevant Twitter handle (like Dakota did) or email address and send a link to your completed article. Don’t send a proposal or an idea. Also, use discretion. You want to be persistent, but not creepy. For example, don’t comment on the editor’s wedding picture on Instagram, asking to be published. To avoid having to hold off on resubmitting a post until someone gets back to you, Dakota recommends giving the editor a deadline. Let them know if you don’t hear back by a certain date, you’ll pursue other options. Listen to the show to hear an example of what to say in your email to an editor. There’s a slew of metrics on Medium. For instance, the heart, which is the equivalent of a like on Facebook, is called a “recommend.” You can also see the number of comments, reads, and views. The reads metric is based on whether Medium’s algorithm thinks the reader finished the article, whereas views don’t require someone to read the whole text. Medium offers a number of useful metrics. Someone doesn’t have to be logged into Medium for a read or view to count. (It’s considered a read when the algorithm thinks someone finished the article.) People need to be logged in to recommend a post. 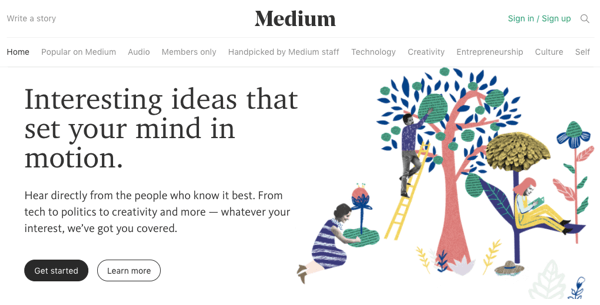 I ask how you get your article to appear on Medium’s home page. Dakota says the news feed that you see on the home page is different for everyone. Although the algorithm for the feed is always changing, the one thing you can control is your followers. Interaction via comments and other engagement tools helps you become more visible in other people’s news feeds. Also, if you can become the go-to person on a specific niche in Medium, your content is more likely to reach people who are interested in that topic. Listen to the show to hear my thoughts on how Medium’s algorithm compares to Facebook’s. When I ask if you can republish posts on Medium, Dakota says yes, as long as you’re present on the platform. He has seen people copy and paste content from their blog and then not engage. You have to be active. That means responding to comments, tweets, and private notes left on your articles. For example, after the 14-day waiting period with his Inc.com columns, before Dakota reposts, he’ll take an hour or two and make the article more Medium-friendly. For example, his audience likes personal stories and posts that have a different tone and style than Inc.com uses. 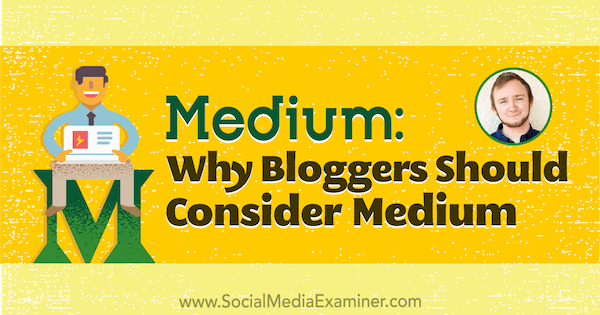 Be sure to include a link to the original blog post or article at the bottom of your Medium post. You may get newsletter subscribers and regular readers that way. When you republish something on Medium, add a link to the original post. To become the go-to authority, you really need to pick a niche on Medium and ruthlessly stick to it. And that doesn’t just mean writing articles. Medium rewards comments, too. Write two articles a month, Dakota suggests. Then each week, write a thoughtful comment that drives discussion on one or two articles that are trending in your niche. Adding comments like this will help your profile pop up in everything in your niche. Also, add a call to action at the end of your articles that offers a freebie. For example, if you write an article on how to prepare to run a marathon, consider making a PDF with a runner’s checklist. Then at the bottom of your article, link to your squeeze page with a short description of what someone will get in exchange for clicking the link and entering their email address. This tactic can be a great way to grow your email list. Add a call to action with a link to a freebie. On Medium, you can change this call to action retroactively so you can update your freebies and calls to action as your business needs change. The process is quick and easy to do. Listen to the show to find out how receiving recommends on your comments helps your overall visibility on Medium. 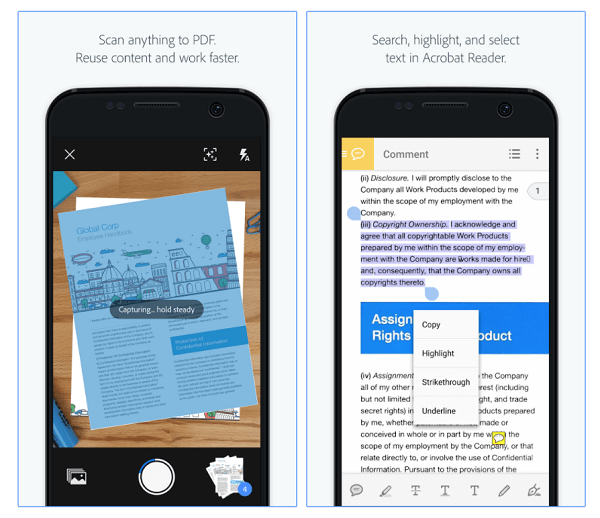 Adobe Scan is a powerhouse capture app for creating PDFs. The app uses your phone’s camera to scan images and text into a PDF. Because Adobe Scan has optical character recognition (OCR), you can then start copying and pasting the text you just scanned. OCR also makes the content of your scans searchable. For example, you might scan a document with images and text and copy parts of the text for a series of posts on social media. The search feature makes it easy to find the text you want, especially in a long document. Adobe Scan is an all-in-one capture tool. Adobe Scan is free and available for iOS and Android. It’s an all-in-one tool for converting print content into a digital format. Listen to the show to learn more and let us know how Adobe Scan works for you. Learn more about Dakota on Arctiphi.com. Check out Dakota’s articles on Inc.com. 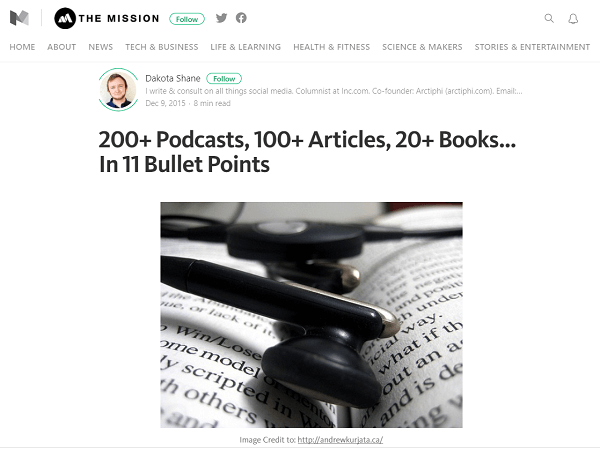 Read 200+ Podcasts, 100+ Articles, and 20+ Books in 11 Bullet Points. Take a look at The Mission on Medium. Learn more about Medium tools such as Rabbut and Upscribe. Follow Medium co-founder Ev Williams. What do you think? What are your thoughts on Medium? Please leave your comments below.